Employee: Has anyone seen The Maze Runner? Is it any good? Husband: It was pretty good. But you should read the book. It was awesome. Employee: Why would I read the book when I can just go see the movie? Husband: Because the book is almost always better than the movie. Employee: *rolls eyes* Only old people say that. This struck me to the heart—like a failing pacemaker, I presume, since I’m apparently OLD. Maybe it was the way she said it: very nonchalant, like her viewpoint on the subject was beyond commonplace and she couldn’t believe that adults couldn’t get up to speed on the fact that reading is a last resort for teens. Maybe it shocked me because just a week before, we had finished an extended family lunch, and when the kids disappeared to do their own things, my thirteen-year-old neice retired to the couch for a bit of texting. Totally nothing wrong with that. Completely natural for a teenager to dash for the phone upon being released from a dinner with the old farts. But I couldn’t help thinking that if that had been me however many years ago, I would have been curled up with a book. And it made me sad. I want my kids to have the same happy experiences with books that I did, and with the advance of technology, that’s becoming less and less likely. And then, to add insult to mortal injury, I found this dreadful little pictograph at Jane Friedman’s blog (it’s at the top of the post, so you can click over to view it); it shows how books rate in comparison to other interests for kids. As you can see, reading is at the top of most kids’ radar through age 10, after which point it makes a sharp dive until the age of 14, when books don’t even make the top 8. Maybe I’m the only one, but this FLOORED ME. I think that, despite many conversations on this topic, authors don’t always recognize how widespread and real the disparity is becoming between kids and books. As writers, most of us love to read, and we hang out with people who love to read, and we’re all on a mission to instill a love of reading in our kids, so many of our kids and our friends’ kids like to read. So when we hear about the declining interest in books among teens, we’re all, Oh, that’s awful. But we don’t realize how true it is because we see information to the contrary within our own little authorial bubbles, where books are a huge priority. We don’t really get what it’s like for the rest of the world. And the question becomes: how do we reverse the decline? For me, I think the answer is two-pronged, consisting of what we can do at home and what we can do in the industry. This post is already dragging on long enough to turn off avid readers, so today I’m going to address the first point and come back to the second part another time. I’d like to start by sharing some of my personal ideas for raising the value of books and reading at home (or at school). This is a very short, very individualized list of things that have worked for me, so I’m really hoping that you all will add to my ideas in the comments section. 1. Make Reading a Desirable Activity. These days, kids have a lot of choices about how to spend their free time. If they view reading as something boring, it’s always going to be low on their priority list. So come up with ways to make reading a desirable option. My daughter is six, and while she reads well, it’s not her favorite thing to do; she’s incredibly people-oriented and will always choose a social activity over a solitary one, so I’ve had to come up with some underhanded unique ways to get her to read. One thing that has worked really well? I pushed back her bedtime and declared those 15 minutes to be “Reading Time”. She can read during that time, or, if she chooses not to, then she can go to sleep. You can guess what she picks. Now, every night, she reads for at least 15 minutes—sometimes more, if she’s really into her book and it’s not too late. Other ideas I’ve seen is to put books in places where kids spend a lot of time, like the bathroom and the car. Make reading the best possible choice, and they might do it more often. 2. Limit Other Activities. Now, I’m not saying that you throw the phone in the trash, because we don’t want to inadvertently spawn THE APOCALYPSE. But if our kids have access to electronics 24/7, they’re going to use them. And the likelihood of them doing anything else is small. It’s perfectly healthy to implement some electronics-free times or zones where electronics aren’t allowed (unless, of course, they’re being used to read a book). I think we would all be surprised what stimulating, creative, and quality activities kids take part in when phones and tablets aren’t an option. Reading might even be one of them. 3. Read Aloud to Them. I won’t belabor this point, since it’s long been lauded as the #1 way to encourage kids to read. But it’s true. If you want your kids to like books and they’re not old enough or interested enough to read them on their own, read to them. It’s still a great idea when your kids are older, because it enables you to learn which kinds of books they might be most interested in reading. 4. Discuss Books. This point kind of goes along with the last one in that when you discuss a book you’ve read with your child, or a book she’s read on her own, it elevates its value. A book is no longer something that you read to simply say that you read it; it has meaning and messages. It means different things to different people. In today’s technological world, kids are anatomically attached to their phones; connectedness—having access to other people 100% of the time—is a priority for them. Talking about books and stories can be a great way of connecting with your kids and turning a solitary activity into a social one. My latest haul from the library. 5. Provide Kids With a Variety of Books. I love to read, but I don’t like to read everything. If you told me how awesome reading was and only gave me contemporary fiction, I would probably choose to sleep rather than read. This is one of the main problems I see with the reading programs in school. Kids are often taught to read using boring basal readers and group story books. In middle and high school, they’re forced to read books that they see as outdated and irrelevant, or books that are incredibly hard to understand. And we wonder why they don’t want to read. Now, allow me to disclaim. I taught school for ten years, so I value what teachers do and I understand the importance of the classics. They teach students many valuable things, but, in most cases, they don’t teach them to love reading. One of the best ways to do that is to provide kids with the kinds of books that they like. If they don’t know which books those are, help them by exposing them to a variety of genres and styles. Get eclectic at the library or bookstore. Bring home books that cover your kid’s favorite hobbies or interests. 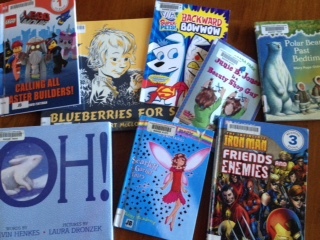 Try different formats: novels, graphic novels, comic books, nonfiction, and biographies. My son is five and can only read the most basic of books on his own, but we’re reading our way through a Superman sticker book together, and I’m always ready to stop before he is. Explore the different kinds of books out there until you find something your kids love. Then drain that well dry. 6, Model Reading. This is another idea that has been praised to the point of Well, duh. As a teacher, as a mother, I’ve always known that if I want my kids to like reading, they need to see ME reading, see that I enjoy books and value them. I never imagined this being a problem, since reading has always been my #1 leisure activity. But, ironically, things changed when I had kids. Suddenly, I had no time for ANY leisure activities. Reading is the one thing I’ve held onto, but I’m only able to do it before bedtime. As a result, my kids don’t ever see me reading. When I realized this, I made it a priority to sit down at least once a day and read. In car line with my son, at home on the couch, at the park while my kids are playing—even if it’s just for ten minutes, if they can see that I’d rather read than check Facebook or crush candies or watch TV, then it becomes an activity that has value. And they’ll be more likely to explore it for themselves. These are just a few of the things I’m doing to try and show my kids that reading is fun and books are important. But, honestly, they’re 5 and 6. I’ve heard a lot of stories from parents about how their kids loved books at this age but wouldn’t be caught dead reading for pleasure as a teen. This is an important issue for me, so I’d really love to hear your ideas on how you encourage reading, particularly as they apply to older kids. This entry was posted in MG & Kidlit, Reading, Uncategorized. Bookmark the permalink. Here is another idea to consider if your daughter or son is very social. You could start a mini book club and let them meet at your house 1-2 times a week or even hold a video conference on your tablet. Even if it is just one other friend in the neighborhood that could be a good driver to encourage reading. If you have someone to talk to about your book it’s like taking a good friend along on your journey. I love this idea. What a great way to encourage reading! I have four kids, ages 15-20. While they often read for pleasure through elementary school, school-required reading started taking its place after 6th grade. Junior high and high school required novels were usually dismal, historical, war-related, or difficult (for AP courses), and I believe that sucked the joy out of any desire for personal reading time. Their high school work loads also were/have been very heavy, leaving very little time for fun reading even if they wanted to. Being an avid reader myself, this is very disheartening to see. I’m hopeful my kids who enjoyed pleasure reading when young will make the time for it as adults. A very interesting post, Becca. My own two are adults now and still love reading as much as ever, but were lucky enough to grow up before the real computer/Internet age. My wee granddaughter (almost 3) loves books and I do hope reading will become a life-long pleasure. I’m proud to say my four grandchildren love to read. Thanks to Montessori schooling, and exciting teachers, the younger two read as well. My granddaughter even wrote a story equipped with illustrations to which I made into a book using LuLu Jr. She was so proud to see her own book. She even held an autograph party. I think something like that should be offered in schools, combining kids computer skills and such. Parents, grandparents, teachers and friends all influence children in whether or not their reading habits will sail or fail. But, the first to begin is at home. Sorry….But, the first place to begin is at home. My daughter is a teen and loves to read. My son has more trouble as his reading level is only 4th grade though he’s a teen. We’re working on it but it’s difficult. Like you said, I make it a priority to show books are important to me around the house. I hope he continues to read and yes, a lot of times, I think the choices that school makes for reading material hinders their interest. He did like The Outsiders though. I’m an outreach librarian but I used to be the supervisor of a children’s department so I can affirm what Kerry Ann said. The AR lists may encourage some kids to read. Maybe. But they discourage a vast number who would like to read something else. As for summer reading lists, the best ones I’ve seen give multiple options with a variety of books from which the students may select one that intrigues them. Face it. Not everyone is going to love to read with the passion (some might say addiction) we do, but everyone needs to be literate, and the only way for them to become literate is to read. And while there’s nothing wrong with technology, we all need a little “off” time to just unplug and enjoy life. I don’t necessarily think that reading is in as much danger as everyone says it is. I think children (and teens, especially) are getting stories in other formats, and I don’t think there’s substantial evidence that teenagers are actually reading less. I mean, sales data is confusing (also easily manipulated – lies, damned lies, and statistics) and often misleading. A LOT of kids are, rather than reading, listening to audiobooks. Or reading fanfiction (don’t knock it – a lot of talent authors get their starts there!). Also, and this is kind of sad, but statistics like that never take piracy into account. Teenagers hate to rely on their parents for money. Most, if given the choice, would rather do something slightly illegal that all their friends are doing anyway (downloading) than have to beg mom for book money. So I absolutely believe teenagers are buying fewer books. But there’s a lot of really good material available for free (legally and illegally) and that’s where kids are looking. That said, I agree with the general idea: kids need to be encouraged to read in the home. It’s a wonderful process to curl up with a paperback – I just wouldn’t worry about the future of our young ones too much. I wonder how this compares generationally. I’m only 30, but electronics were still rare in my elementary school days–no cell phones or tablets, certainly, limited home video game options, very rare home computers. But even lacking electronic distractions, reading still wasn’t a popular pastime among anyone I knew. Nobody made fun of me for reading during lunch, but they all thought it was weird. Instead of being glued to computers, everyone was just glued to TV. I do know folks who didn’t care for reading in school, then discovered genre reading after high school and became regular readers for the first time. So it isn’t irreversible! As the Common Core stuff comes in, reading will get worse. It expects kids to read fluently in kindergarten, it’s not fun, and they only read nonfiction (which reminds me of the Dawn Treader, how Eustace only liked books about grain elevators or fat children doing exercises in foreign schools.) I got my 5 year old a common core workbook by mistake, and it’s such a waste of money. We’ve abandoned it for A Beka books, which still teach, you know, basic reading and math skills. There’s a lot of misinformation floating around about the Common Core. Fiction, poetry, and drama are absolutely part of the standards, and children aren’t expected to read and write fluently in Kindergarten. where it’s clear that there is no standard requiring independent reading of any text in Kindergarten, and that even in first grade, reading of grade-level texts is with prompting and support. It’s great to see you taking the initiative to share your love of reading with your children. Starting them young pays off. My son loved the Narnia books when he was little, too, and he’s remained an avid reader all through his teen years. I’m just going by the CC book I was trying to use with my daughter. It was for Kindergarten, yet there was so much reading involved that was so far beyond her skill level. She was getting really discouraged, so we switched to other things. I did EVERYTHING you suggested in your list—and it worked. Both my kids grew up avid readers. I will admit, though, that texting didn’t explode as a pastime until they were graduating from high school. Whew! Even so, they loved to read even through their teen years and still do in their early 30s. One key, I believe, is that when reading to your children don’t read in a boring monotone and always read material that stretches their intellect. It continually exposes them to more complex stories and lets them know there are rewards for improving their reading. The reading list for my kids spanned “The Perky Puppy” to “Great Expectations.” Yes, they sat for one chapter per night of Dickens. It was an experiment and I was pleasantly surprised they wanted me to continue. It was one of the last books I read to them. This is such a great testament to reading to older kids, too. I think it’s somewhat natural to read when they’re young, but once they can read for themselves, we so often stop reading to them. I love that you read them Dickens! What a great idea. As a writer with a library day job, I have SO much to say about this, but I’ll keep it brief. We stock both books and DVDs, and the DVD circulation is three times that of our beloved books. When the adults don’t read, usually the kids don’t read. And the school mandated reading takes the joy from kids discovering books they love. Around here students must take AR reading tests to acquire points. I can’t tell you how many times I’ve watched in horror as a parent tore books from their child’s hands because they “weren’t AR books.” Breaks my heart each and every time. Ugh. This makes me so sad. I love the AR program, but for parents to restrict their child’s reading to only books on the list defeats the entire purpose. It reminds me (somewhat) of this post I recently read by Shannon Hale, about boys being dissuaded from reading “girl” books. So upsetting.